The apartment is located in a convenient location for easy access to local bars, restaurant, beach and numerous local activities. Inside: 2 bedrooms – 1 double bed, 3 single beds, fitted wardrobes, external blinds, double bedroom opens onto the terrace. Living/dining room – sofas, satellite TV with USB port, DVD player, extendable dining table with 5 chairs. Doors open onto the terrace. Kitchen – the kitchen is fully equipped with crockery, cutlery, glassware, cooking utensils, fridge-freezer, oven, 4 ring ceramic hob, microwave-grill, dishwasher, coffee-maker, kettle, toaster, juicer, vacuum cleaner, iron and ironing board. 1 bathroom with shower, basin, WC, washer/dryer and hair dryer. 10m private terrace with wooden furniture. Drying rack. Pool and garden views. 4 sun-loungers. The apartment has an assigned underground parking space. The garage has secure remote control only access. Street parking is also easily available. Nearest airports are Girona (45min by car), Barcelona (1.5 hours by car), Perpignan (60 min). Ryanair fly to Girona. Sheets can be provided at a fee of €14.52 per person per stay. We have spent a wonderfully relaxing 2 weeks. We enjoyed our holiday in Roses. It was a very beautiful area. The Apartment was perfect. Had every thing you need. The contact with the owner was very good. We always got a very quick response on the e-mails. I would definitely recommend this apartment. Overall a great time had by all my family. The flat was clean, well equipped and open plan so it feels spacious. 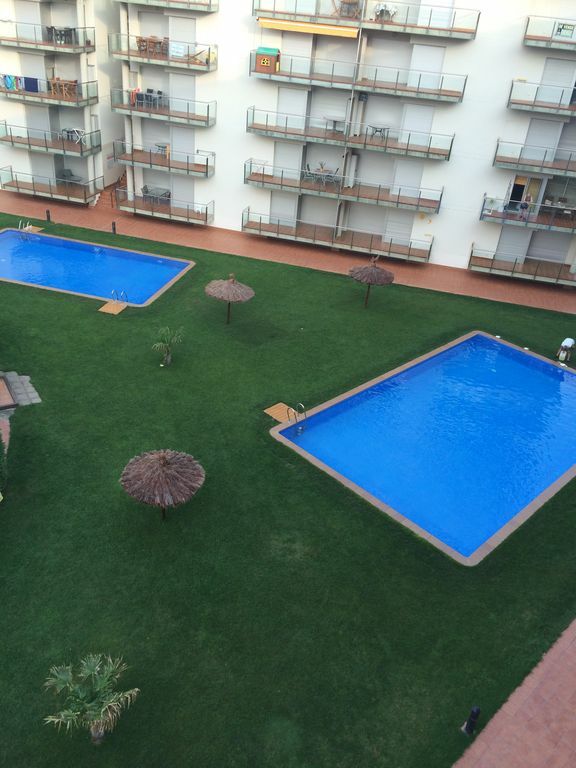 The pools were clean and regularly maintained as was the grass surrounding them. Supermarkets and restaurants were all in easy walking distance. Similarly the water park and the beach were a 10 minute walk. That said, the center of Roses is a good walk away but St Margarida has all you really need. Prior to our arrival, the owners provided all the info we required and the managers were also helpful. On our last day when we handed back the keys the agent was there exactly when he said he would be so there was no waiting around when we had to leave. With respect to bars and restaurants our favourites were Sweet Coffee (free wifi so the kids were happy) and Rey de la Pampa. Service was super friendly. We went on the Don Pancho trip to Cadaques which was a nice day out although the water park was the highlight for our 10 and 14 year olds. The property is exactly as descibed and shown on the website, it has everything you need, including plenty of cooking utensils, cutlery, crockery and even cleaning stuff like washing up liquid, dishwasher tablets and laundry detergent! The property was also clean and in good order for our arrival. From first enquiry, to the end of our stay was well managed and seamless. Karl & Michelle are very accommodating and easy to deal with, so too was the agent for key collection etc. The property is very well positioned for supermarkets (we liked Carrefour, just accros the roundabout on the main road) and bar restaurants (El Rancho within walking distance was good for a Saturday night meal out, other less expensive ones are close by too). It's also easy getting out and about to visit the areas many attractions. (a car does help but not essential as there are excursions available from the centre of St Margarida), and although WE are not beach people the beach at St Margarida does look very nice. The three pools in the complex are well maintained and inviting, although a little chilly when you first get in! If you do have a car then the parking garage is great and the security is brilliant. All in all we had a wonderful stay and would not hesitate to recommend to anyone who is interested in a self catering holiday. Thank you Karl & Michelle. Very comfortable apartment for stay with family with 1 to 3 kids. All description of the apartment is absolutely correct and we found everuthing in quite new and good condition. We were staying with our 9 years-old daughter. First impression was a bit spoiled by the lazy Spanish guys from customer service because the clean linen was not provided when we arrived and we had have to ask them and were waiting for it several hours. Also we have not got any reaction after asking them for a repair a rolled curtain. A bit noisy because of many kids were playing around the pools and on the neigbours balconies till the midnight and even later. But excellent beach with smooth sand approach to the sea is also perfect option for the family holidays. A lot of water sport (e.g. I was using windsurfing), many attractives for kids all around the Roses including aquapark and kids amusement park. A lot of supermarkets enabling an own cooking along with many restaurants and bars for different kinds of demands. The big advantage is the underground car parking place included in the apartment rent cost. Good location to travel by car through the whole Catalonia and Costa Brava what we were doing a lot. Most amazing thing is that all the time we were there we were viewing very surrealistic and phantasmagoric dreams which we never had seen neither before nor after this time. Now it became very easy to understand the roots of the Dali's art. Comme l annee passee, super sejour. Karl et Michelle toujours a l ecoute. Appartement super bien situe et ttes propres. Nous reviendrons l annee prochaine!! 2 bedroom apartment in Sta Margarida (Roses). Sleeps 4/5. The apartment is a new construction, 10 minutes walk (0.8km / or a few minutes by car) from long sandy beaches. The building has 3 pools, gardens, patios and private 10m terrace. Renters can use an assigned underground parking space that has secure remote control only access. Sta Margarida - Roses has something for everyone; local activities include bars, restaurants,Salvador Dali Museum, golf courses, Aquabrava water park, Cap de Creus natural park, karting, spa, boat hire, jet-ski hire,internet cafe,boat trips, flamenco,discos, bowling, wind-surfing, paragliding, sailing, tennis, skydiving, scuba-diving cycling and more. Easy access to the 'Pyrenees Orientale''. Great roads for Bikers! !